Ramesh, T., Kalle, R., Downs, C.T. Agricultural expansion has replaced many natural habitats and the landscape structure with potential benefits to certain wildlife species. Some of mesocarnivores widely use man-made habitats in agri-ecosystems that are devoid of large carnivores and often prey on livestock. 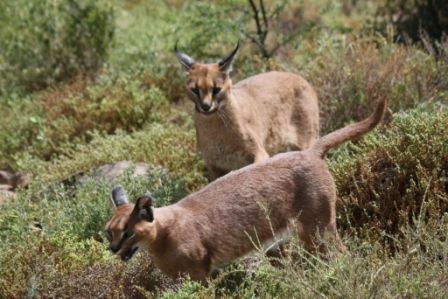 We examined the space use and habitat relationships of radio-collared caracals Caracal caracal between May 2013 and December 2014 in the Drakensberg Midlands, South Africa, to identify suitable habitat for better management of caracals that are perceived as pests in these fragmented agricultural mosaic landscapes. Home ranges of males were bigger than those of females. Caracal movements increased more during the night than the daytime indicating avoidance of peak exposure time to human activities during the day in agricultural lands.